I am Judith’s husband and thought I should write our story in the light of reading some recent e-mails from new patients. I will keep it as short as posssible as I can be long winded on the subject! Judith was sent by her GP to a local dermatologist, Dr. Peter Coburn. 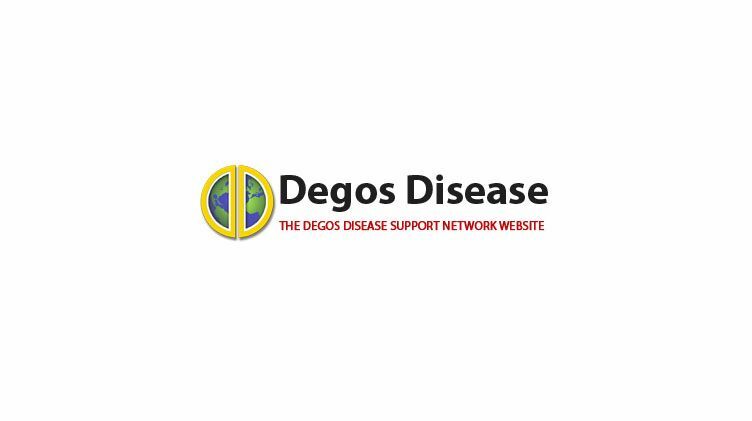 He said that he thought the disease was Degos but would take a biopsy to verify. Judith came home and told me. It meant nothing to us. Unfortunately Judith looked it up on the internet. Death was the only prognosis. Three weeks later Dr. Coburn phoned Judith at school (she was teaching) and she went to him immediately and he confirmed the diagnosis. He also had made an appointment for Judith to see Dr Robin Russell- Jones, the top man in UK. The following day in London the first question Robin Russell -Jones asked us was had we looked it up on the internet. He then told us not to believe it. He believed a large proportion of patients survived. (He has been proven correct). However he knew nothing of the cause , nor hence a cure, for the disease. However Judith agreed to accept trial treatment. So over the next 2 years Judith was treated on the assumption that the illness was immune related. During this period two important things occurred for us. 2.Judith started a website to find other patients. Sadly, the treatments being prescribed for Judith didn’t work. Indeed she became ill on various fronts (MRSAtwice!) but especially when the lesions became ulcerated. Robin Russell Jones finally told us that he had exhausted all conventional treatment. We have no complaints about this. By one of these strange twists of fate,within a week of Judith’s leaving Russell -Jones, the father of a patient in Germany wrote to say that he had read an article by a German professor saying he had cured the disease.. We took the e-mail to our GP who picked up the phone and phoned the professor (he hadn’t cured it – he had treated one patient who was still alive). Four days later we were at the University Hospital in Berlin. To cut the wonderful story short Professor Zouboulis was appointed to look after Judith and was granted funds to research the disease. I wept when he told me this. And so Judith set up a partership with Professor Zouboulis. Her role was to find patients as we need patients to do research and he does the research. (Well, Dr Theodoridis does the work as the assistant!). So from our perspective, new patients are good news but for the patients it is of course worrying. Judith herself suffered terribly from ulcers on her feet and had to be treated daily at home by nurses (she was in great pain and on morphine). She of course had to retire as indeed did I to help. Then another sort of miracle happened. At a time when Dr. Coburn thought we might have to amputate a foot, Judith suggested to the nurse that she try a particular brand of honey to treat the ulcers.. With nothing to lose the nurse did so. Two weeks later her wounds were healed! The nurse was to return to university and wrote a thesis on the application of Manuka honey to ulcers. Standard practice now in UK. Back to Degos. Judith and Prof. Zouboulis organised a conference on the disease in Berlin. We attended with patients from different parts of the world (mostly America). Amongst those attending was a mother from Boston whose 5 year old had died. Dr Patrick Whelan was his doctor. Subsequently a further conference was held in Boston. So information is building up. My advice to people who have just been diagnosed is the same as that given to us by Robin Russell Jones. Most people survive. Our GP is Dr. Charles Shlosberg. I called him at 2.00am one night when Judith was in great pain, He came round immediately. Whilst administering morphine he asked Judith a simple question. What is the difference between God and a doctor? Answer: God does not think he is a doctor. For those who have unsympathetic doctors – ditch them. I have of course met Drs Coburn, Whelan, Theodoridis, Russell- Jones, Shlosberg and Prof. Zouboulis.They are caring wonderful people. If you were to meet Judtih today you would never know what she has been through. But she corresponds regularly with many people (ok many in our little world is not huge) and has met more patients than anyone alive. If you feel lonely please contact her or myself. We know what it is like.